I put together this slide show of pieces and text I exhibited at the new Waterbury Public Library in March and April. I hope it gives some sense of how I try to share my work with others, help people connect to the work and art in general. I got the clementine show up at the library and have been flailing a bit about what to do next. This has not been helped by the choppy schedule of school vacation as well as snow- and teacher inservice-days that have eradicated any possibility of routine. Although it doesn’t feel like much of a plan, thought I would work on the figure… and self portraits have the advantage of not needing to pay a model… Here are a few quick studies, in theory all me. I am pretty sure you wouldn’t be able to identify me on the street with just these, though! Still, some progress, I think. Maybe I should call it thug life? They do all have a mugshot-like quality (which wasn’t what I was going for). Ah well. One of the underpinnings of writing this blog is to show myself to the world (okay the 3 people who read it) even when it doesn’t necessarily feel like my best foot forward. Wednesday was my painting class. The teacher brought in white tulips and we set up a little still-life. 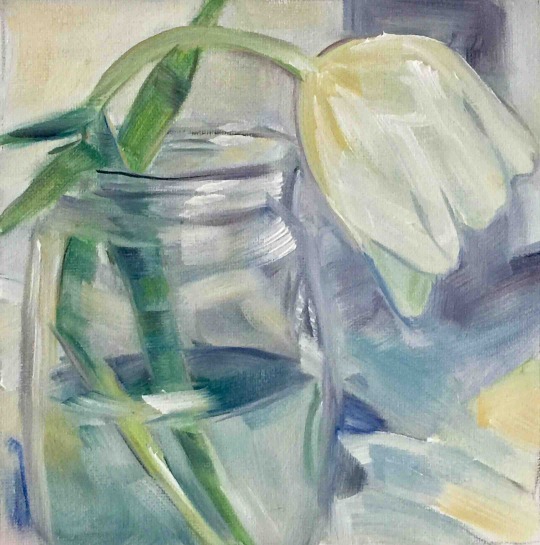 I thought it would be fun to challenge myself by making the whole thing as white as possible and see if I could differentiate it in the painting: white tulip in a clear jar on a white cloth in front of a white wall with some bright light coming in one corner. (I set to work, trying to look for colors in the white, trying to figure out relative values. Hmmm. 30 minutes of work and the surface is covered, but it’s sure not interesting or looking good. Was I trying to prove something to myself or to my classmates in this crazy all-white still life? Damn ego! Keep looking! Take another stab with a new layer of paint. 30 more minutes. It’s messier. Brief moments of truth have been smeared and now lost by followup moves. What on earth can I do?? The teacher is looking over my shoulder, making me even more self-conscious of the blotchy mess in front of me. I am pretty sure no one else has this awful mess in front of them. They were all smart enough to choose colored backgrounds and translucent or opaque vessels. Why is he still standing there? Laughing at hubris? I am going to fail, and my stomach knows it, churning. I tried to challenge myself and maybe actually I was just showing off and now I am going to fail, and do it pitifully, in front of the whole class. Wow, this is so uncomfortable. This is awful. Should I just leave now? Quit for the day? Maybe forever? I have no idea how to turn this paint mess into something that feels at all like the lovely little still life in front of me. Keep looking. More paint. Maybe this other yellow will help? Try this different hue – hmm, that’s pretty. But it doesn’t work a miracle – still a mess. I do not like this Sam I Am. Lesson learned? Keep looking. Keep painting. Keep looking. Keep painting. At the end, make the best of what’s there. If the eye has been even half good, and there has been persistence in the recording, sometimes I will get lucky with the make-the-best-of-it part and end up with a recognizable little painting. I’m still marveling at how the last 4 minutes of my work on that strawberry painting yesterday completely transformed it. The colors were all there, the rendering was the same, but I think was trying to capture too much information accurately. It was hard to figure out where to focus the eye and how to make sense of it, and the painting just didn’t really engage the viewer. 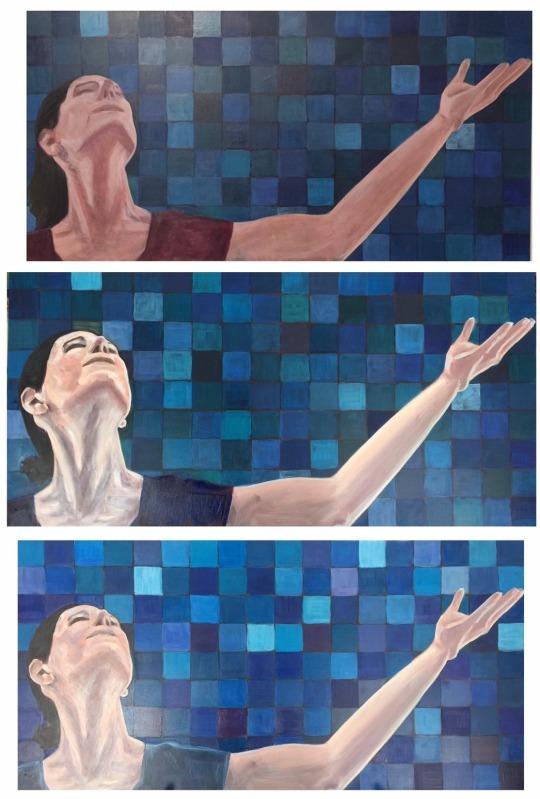 I remembered Dominique’s fourth step in her process, the edges – and making sure they are intentional and varied. I started smearing some edges along the glass, in the places where the light was bouncing around and in effect smearing the view anyway. I tried to clean up/sharpen the edges of the main strawberry, also edging the leaves with red to try and make them crisper. That helped a lot, and then I wondered about putting in the seeds, which I had been resisting because almost always when I try to put in tiny bits of color, I make a gloppy mess. 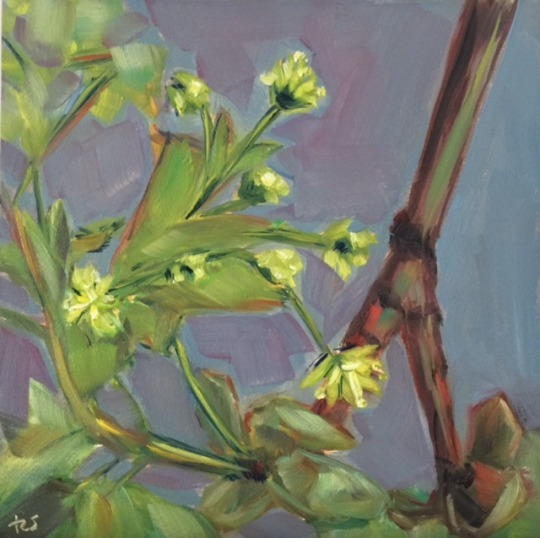 I thought, what the heck, this is sort of awful anyway, I might as well try scratching in the seeds (removing the paint with a tool recommended by Carol Marine) and then suddenly it was so different – so lively, friendly and captivating. So, for the first time I could really see the difference the edges made, and how lovely and fun it is to play with them in the wet oil paint. Now, how to put this to use more frequently?